This workbook uses ArcGIS 10 for Desktop to teach how to automate production of crime maps and build a crime mapping system. 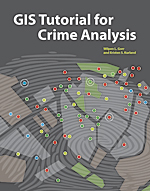 Written by seasoned GIS Tutorial authors, the book offers law enforcement professionals, including crime and intelligence analysts, as well as students, a definitive resource to develop a systematic approach to crime, threat, and hazard mapping and analysis. It includes independent exercises to introduce key GIS skills, such as data preparation and template building. For the college curriculum, instructor resources are also available. ISBN: 978-1-58948-214-2, 296 pp., $79.95. 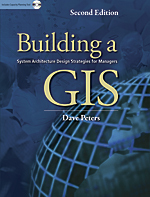 Building a GIS promotes the effective planning and implementation of a GIS infrastructure using a time-tested approach to system architecture design. Written for IT experts adopting GIS technology, GIS professionals new to system design, and executives who need to manage change, the book describes performance models, developed over many years, to help guide design decisions. The second edition has been restructured to better align the concepts. It also includes an updated capacity planning tool (CPT), which automates system design analysis tasks that GIS managers and technical architects can use to better assess options before committing resources. The CPT is available on the book's DVD, along with exercises and video presentations that help readers further hone their expertise. ISBN: 978-1-58948-307-1, 172 pp., $59.95. 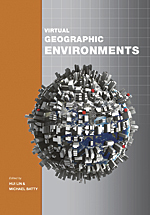 Republished by Esri Press, this collection of papers—originally presented at an international conference on developments in visualization and virtual environments in geographic information science—describes the importance of virtual geographic environments as the basis for GIS in design. Edited by professors Hui Lin and Michael Batty, the book discusses online virtual environments and Web 2.0 technologies; virtual cities and virtual landscapes; user interfaces, public participation, and geovisualization; mobile and networked geographic environments; and mobility and dynamics in visualization. ISBN: 978-1-58948-318-7, 364 pp., $49.95. For more information about Esri Press books or to order, visit esri.com/esripress.